The information in hotel registration forms is provided by each service supplier. Why is the ECO-TAX so important? The ECO-TAX helps us maintain and improve the city’s infrastructure so that Bariloche gets even better for you to visit. By law, a 50% discount in the Ecotasa tax is applied in low-season months (April 1st through June 30th). ECO-TAX will not apply to: Bariloche residents (required: original and a copy of ID DNI specifying current residence); children up to 14 years old (required: original and a copy of ID DNI, passport, birth certificate and/or any other identity document specifying date of birth); disabled persons (required: original and a copy of disability certificate and ID DNI); athletes up to 18 years old (required: original and a copy of ID DNI and any proof of attendance to an official sports event organized by the federal, provincial or municipal government). TO GUARANTEE PEACE OF MIND CHOOSE AUTHORIZED LODGINGS. 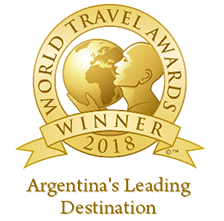 Bariloche selected Argentina's Leading Destination 2018.